Supply, and Regulatory missions. gation work on structures is performed by contract. USACE primary navigation responsibilities include for example, directly parallel to I-95 and potentially planning and constructing new navigation channels and a valuable shortsea shipping corridor, say that they locks and dams, and dredging to maintain channel depths can’t get the tonnage if they don’t have the mainte- at U.S. harbors and on inland waterways. We operate and nance dredging to maintain draft. What can be done maintain 12,000 miles of inland and intracoastal water- to change that metric? 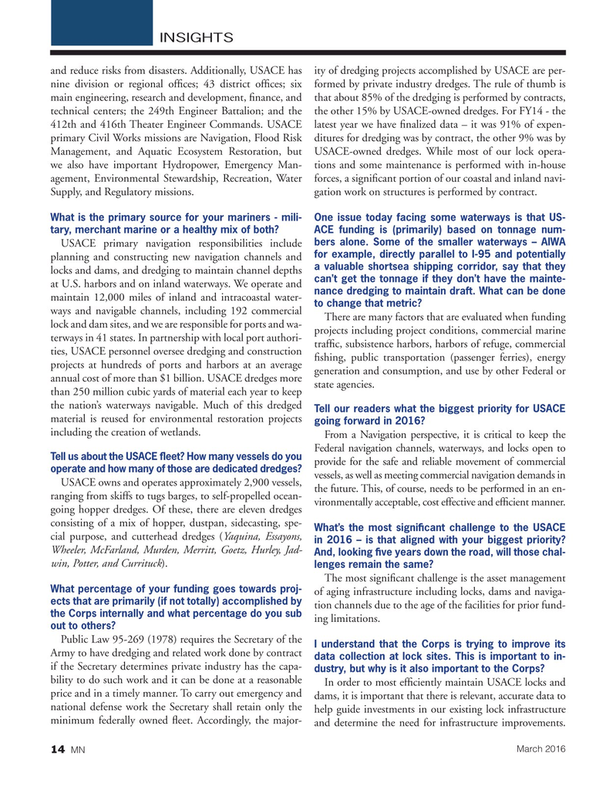 Tell our readers what the biggest priority for USACE material is reused for environmental restoration projects going forward in 2016? including the creation of wetlands. Tell us about the USACE ? eet? How many vessels do you provide for the safe and reliable movement of commercial operate and how many of those are dedicated dredges? What’s the most signi? cant challenge to the USACE cial purpose, and cutterhead dredges (Yaquina, Essayons, in 2016 – is that aligned with your biggest priority? And, looking ? ve years down the road, will those chal- win, Potter, and Currituck). What percentage of your funding goes towards proj- of aging infrastructure including locks, dams and naviga- ects that are primarily (if not totally) accomplished by tion channels due to the age of the facilities for prior fund- the Corps internally and what percentage do you sub ing limitations. Army to have dredging and related work done by contract data collection at lock sites. This is important to in- if the Secretary determines private industry has the capa- dustry, but why is it also important to the Corps? In order to most ef? ciently maintain USACE locks and price and in a timely manner. To carry out emergency and dams, it is important that there is relevant, accurate data to national defense work the Secretary shall retain only the help guide investments in our existing lock infrastructure minimum federally owned ? eet. Accordingly, the major- and determine the need for infrastructure improvements.